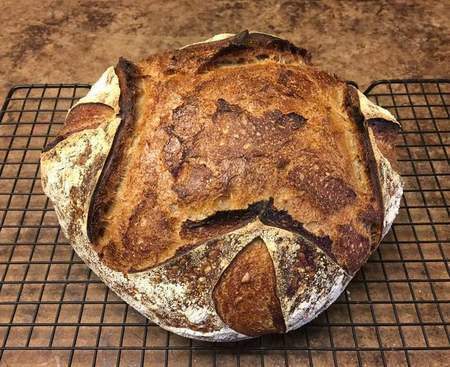 I've been a bread baker for more than 40 years, refining my technique in recent years. I've attended two one week courses at the San Francisco Baking Institute, and live in San Francisco. I ordinarily bake a multigrain sourdough loaf of bread; but am an amateur bread enthusiast baker. 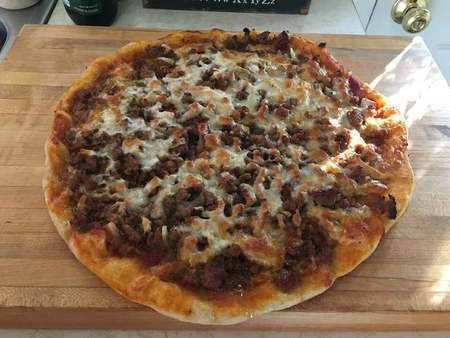 I've dabbled with pizza over the years, and have seen improvements over time. My usual crust is sourdough, with 90% bread flour and 10% whole wheat, 65% hydration, 2% salt, and 3% olive oil. I like toppings rather simple to highlight the crust. I bake in a home oven preheated to 550 degrees, with two pizza stones about four inches apart, and fire brick on either side. Pizzas turn out in 6 to 8 minutes. I'm on the road for the holidays and without my usual equipment, but I made a reasonably passable sweet Italian sausage pizza for family today. Just received and started reading THE PIZZA BIBLE. I appreciate the admonition that it is more a matter of technique than recipe. I hope to broaden my understanding of pizza varieties; and as I live in San Francisco, I need to visit Tony's Pizza Napoletana. I look forward to learning from the book and this group. Posting photos of my typical bread and my "on the road pizza." My bread. I'm still learning how this site works in uploading multiple photos. That looks pretty amazing. The PB book will teach you all you need to know about pizza. Best pizza book out there.